This wasn’t a race, it was a life experience. Elevation Profile NOT FLAT! There is 1,738ft of climb and 1,738 ft. of decent. Water Stations More than enough. A number were stocked with a plentiful supply of GU. Highlights Many including running along the Embarcadero, the Golden Gate Bridge, Haight Ashbury, Golden Gate Park, the running by AT&T Park. Good for Beginners? Maybe not. I have found myself too comfortable with the half-marathon distance. I was inspired by tweeps, friends and family to try and “Cover Just a Little More Ground“. 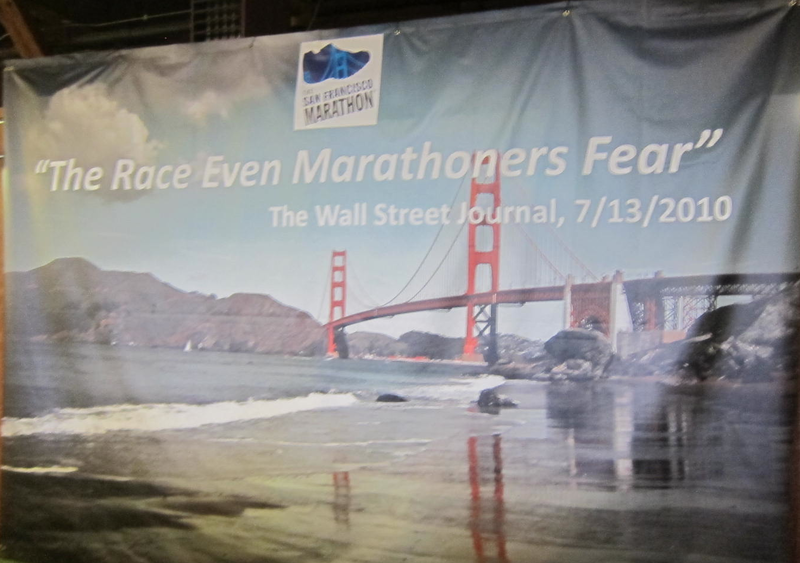 Last year I had wanted to run one of the two half marathons associated with the San Francisco marathon, but work travel interfered. This year the work calendar was more friendly to the event so I decided that this venue of San Francisco in July would be the perfect place to step up to the marathon distance. The race starts at the Embarcadero just North of the Bay Bridge then continues down Fisherman’s Warf, through the Presidio, out and back across the Golden Gate Bridge and then into Golden Gate Park. 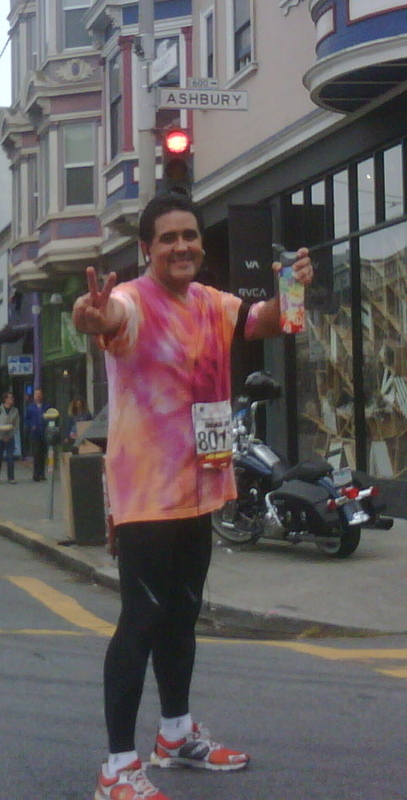 From there, the race goes into historic Haight Ashbury. The last six miles of the course move through residential and commercial areas that bring the runners out to AT&T park. After that, one mile later is the finish line. The course. Each number represents a 4.5 increment. The race also offers two half marathons, one that starts at the beginning of the marathon and one that starts at mile 13. Given the choice, I would have run the more scenic first half of the race. The second half through Golden Gate Park was beautiful but not as special as the first half. There was also a lot of running through industrial and residential areas in the second half of the marathon. Those miles weren’t remarkable, but that’s not unusual when running through a big city. At mile 25, I would have loved the opportunity to run the outfield of AT&T park much like the Disneyland half marathon offers the opportunity to run through the outfield of Angel’s Stadium. As it was game day for the Giants, that was an unlikely tour. The weather is always a variable in San Francisco, but this particular day the temperatures ranged from the mid to upper 50s in the morning to a high of 75. I had running gloves and jacket available at the start line, but I checked them about 15 minutes before my start time. The full marathon elevation profile is presented in the image below. Although the difference between the max and minimum elevation was about 400 feet by my GPS, the sum of all the elevation gains across the 20 or so hills was about 1,738 feet. The hills appear formidable and they are not as bad as they seem. The hills shouldn’t stop anyone capable of running the distance. Remember that the course is a loop, so for every climb there is a descent. In retrospect, there are only three remarkable hills at miles 5, 10 and 14. The first two of them are steep but not long. The one significance hill starts in Golden Gate Park at Mile 14 and ends at mile 17. That one is a grind, but is by far not the worst that San Francisco could offer. These people know how to pull off a race. From registration to post race follow-up, they have all the bases well covered. There were plenty of water stations all well-stocked and staffed. There were also an ample supply of Gu in all flavors well into the race. The race was very environmentally friendly. That was not an accident, it was deliberate, thoughtful and appreciated. With that acknowledgement, my only suggestion for this race is that since GU was in plentiful supply at the water stations, there should have been more emphasis on directing the runners to put the GU wrappers directly into trash cans rather than just dropping them for someone else to hopefully pickup. This could have been a great opportunity for the race organizers or the GU sponsor, to make special containers reminding the runners that wrappers are not biodegradable and need to be properly disposed of. I am not sure how the organizing committee managed to set up the traffic control logistics between miles 20 and 24, but it was amazing. Other runners tried to figure out why we all of a sudden had to change the route, I just did what I was told by the course marshals and it all turned out just fine. I ran this, my first full marathon just 10 days after my 47th birthday. Did I do it in Berlin, where the roads are flat? Nope! I ran it in San Fran-fricking-frisco! They cant’ take that away from me. I don’t mean to imply that this race was in any way easy, but much like life, it is easier if you are running towards something. Mile 19 – You tell me, how was my experience? I wanted to run through Fisherman’s Warf. I was giddy the first time the fog-engulfed Golden Gate Bridge came into view. I only had to run 5 miles to get to this first bite of candy. 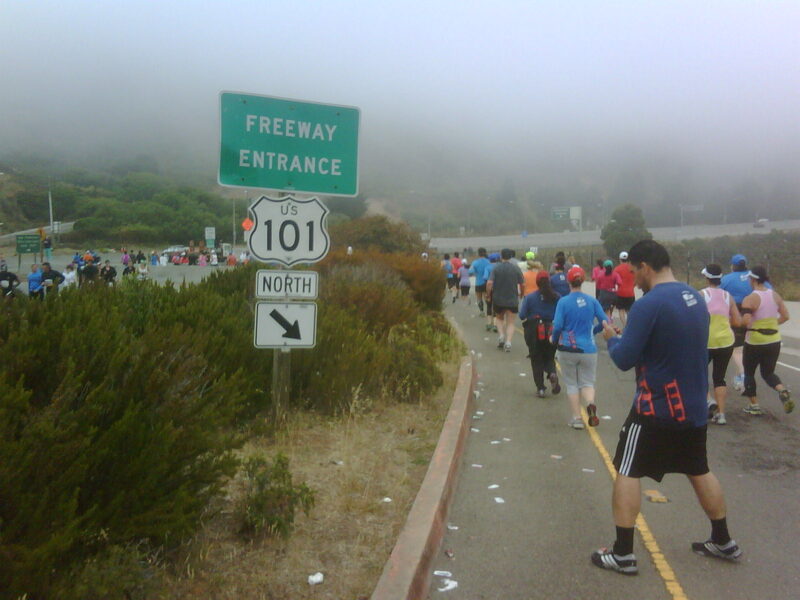 By the time the bridge experience was over, I was at mile 10. It was fun and the fun made the run easy. Kind of like the whole spoon full of sugar thing. 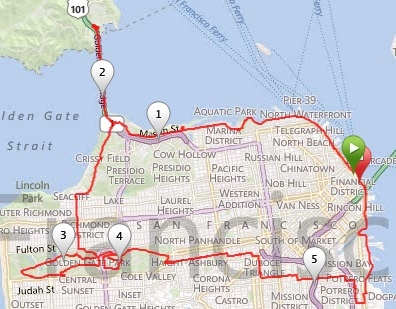 From there it was only 9 more miles to Haight Ashbury. I’m a guy who listens to the Grateful Dead every week and I got to run to and through the famous Haight singing Scarlet Begonia’s with Bob Weir playing on my MP3. Word’s can’t do the feeling justice. Yes, did a lot of singing during this race. I do that. Did I mention that I tie-dyed my shirt? You probably guessed that. It was originally a white Nike cotton shirt. It reminded me why I normally run in synthetic (owies). From the Haight it was just six more miles to get to my second favorite baseball stadium in the world, AT&T park. If you don’t know by now, I have certain idiosyncracies when I travel. When in San Francisco, if I have an extra hour before a flight I will go to AT&T Park and walk that exact route around the stadium that I ran for this race. It’s one of my favorite places on the planet and I got run to it. Was I lucky or blessed to be able to run route that brought me so much joy? I was certainly blessed to be able to complete the distance. I was surprised by the number of people I saw having difficulty near the end. I was tired, but by the grace of God, I wasn’t cramping, limping or in pain. Maybe that had something to do with the bottle of Poweraid and the snacks that my ladies gave me mile 12? I don’t know, but wasn’t that just another type of blessing? Pretty much everything I wrote about in December materialized and was as wonderful as I expected. If you are interested, the link below will show a few more of my pictures from the run. My two half marathons thus far in 2012 were completed in 2:24 and 2:30. With the added fatigue and the hills I was worried that I might not finish in the six-hour time limit. I figured I could reasonably reach the 9 and 18 miles marks at two and four hours respectively. With the fatigue factor and the 3 mile hill, I suspected there was a 20% chance I might not make the 6 hours time limit. My official finish time posted as 5 hours, 32 min and 17 seconds. I was very pleased. Heck, if I didn’t take so many pictures I might have finished a good 10 minutes earlier, but what fun would that have been. 5610 out of 6440 finishers (87%). All in all, I have nothing to complain about and everything to be grateful for. My gratitude extends to all those who supported me before, after and during the race. I am also very grateful to the organizers and the volunteers. ← Yes, Sir. That’s My Baby. I just commented but it didn’t show up, so forgive me if I comment twice. Great recap. You did amazing and I’m so proud of you. I’m always impressed with your ability to have so much fun racing and not stress about extra minutes taken to chat or take pictures. Thank you sunshine. I very much appreciate your support, encouragement and wonderful follow up. You are blessed with a kind heart. I am so sorry it took me so long to read this – it has been on my to-do list for the past few days. I’m so proud of you for finishing and for running joyfully. That’s what I’ll always remember about Twin Cities – there were parts of the course where I was just so beside myself with glee that my heart could have burst. Make sure to bask in the glory of it all for at least another few months! Thank you for your comments and continued support. You Rock Bike Woman. Thank you for this post and I’m so glad I found it. I am 14 days out from running the 2014 SF Marathon, my first marathon, and have had the terrible misfortune, now, of seeing all these internet links to how hard this course is! lol I’ve trained for this distance, I believe I am ready, but the taper and poor reading choices had me a bit rattled. Your blog reminded me that I am running this for the joy of running and the experience and the course will fall in line for me. I also really appreciate you mentioning your half times and your final SF times. My half times are very comparable to yours in 2012 and all I really want from this race is to finish and to finish under 6 hours. Thanks again for offering me a much more positive perspective! It’s a beautiful race. Just keep running towards something. It’s a joyous race.